Pradhan Mantri Ujjwala Yojana is an ambitious social welfare scheme of Narendra Modi Government launched on 1st May 2016 from Ballia in Uttar Pradesh. Under the PM Ujjwala Yojana, the government aims to provide LPG connections to BPL households in the country. The scheme is aimed at replacing the unclean cooking fuels mostly used in the rural India with the clean and more efficient LPG (Liquefied Petroleum Gas). The eligible women candidates from BPL families can apply for the scheme by filling up the Ujjwala Yojana KYC application form (in prescribed format). The interested candidates require to fill the 2 page application form and attach required documents along with the form. The basic details such as Name, Contact details, Jan Dhan / Bank account number, Aadhar card number etc are required to fill in the application form. The applicants also need to mention their requirement of cylinder type i.e. 14.2KG or 5KG. KYC Application forms for Ujjwala Yojana can also be downloaded online and submitted to nearest LPG outlet along with required documents. The identification of eligible BPL families will be made on the basis of SECC-2011 data. However below is the basic eligibility criteria for the scheme. The applicant’s name should be in the list of SECC-2011 data. The applicant should be a women above the age of 18 years. The women applicant should belong to BPL (Below Poverty Line). The women applicant should have a saving bank account in any nationalized bank across the country. The applicant’s household should not already own a LPG connection in anyone’s name. The detailed eligibility criteria of the Ujjwala Yojana is available here. Ujjwala Yojana List of BPL candidates can be verified by checking the name in the SECC-2011 data. Below is the list of mandatory documents to be attached along with the filled application form. View the complete list of documents for Ujjwala Yojana application which can be attached on the basis of requirement. The government has already allocated Rs. 2000 crore for the Ujjwala Yojana implementation for the financial year 2016-17. Government will distribute LPG connections to about 1.5 Crore BPL families within the current financial year. A total budgetary allocation of Rs. 8000 Crore has been made by the government for the implementation of the scheme over three years. The scheme will be implemented using the money saved in LPG subsidy through the “Give-it-Up” campaign. The scheme provides a financial support of Rs. 1600 for each LPG connection to the eligible BPL households. The connections under the scheme will be given in the name of women head of the households. The scheme will be implemented by the Ministry of Petroleum & Natural Gas. This is first time in the history that Ministry of Petroleum & Natural Gas is implementing such an enormous welfare scheme which will benefit Crores of women belonging to the poorest households. This Scheme would be implemented over three years, namely, the FY 2016-17, 2017-18 and 2018-19. India is home to more than 24 Crore households out of which about 10 Crore households are still deprived of LPG as cooking fuel and have to rely on firewood, coal, dung – cakes etc. as primary source of cooking. Eligibility BPL candidates available in SECC-2011 data, SC/ST Households, Most Backward Classes, Beneficiaries of PMAY-G, Beneficiaries of AAY, Forest Dwellers, Residents of Island and River Island, Tea-garden & ex tea-garden workers, other poor households not covered in this list. 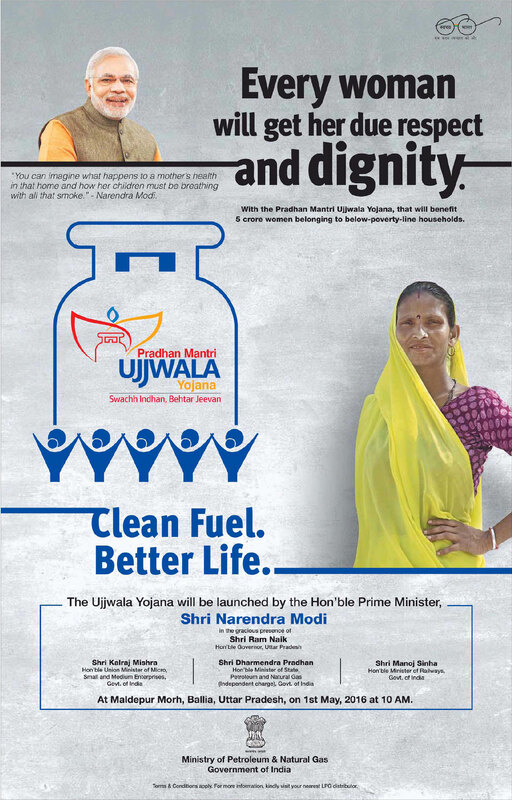 View the Ujjwala Yojana Advertisement in Hindi. NOTE/DISCLAIMER: This website does not invite any kind of applications from its visitors and don’t asks for any money/registration fee. The website also does not ask user’s to share their personal information. Visit official website www.pmujjwalayojana.com for more information. How I can see the district wise list of candidates who would be benifitted by pradhanmantri ujjawala youjna. Is only connection free or the connection plus LPG also free?? There is no clarity in the scheme language. जून 2016 के शुरुआत में केंद्र सरकार तेल कंपनियों को एक लिस्ट प्रदान करेगा जिसमें ग्राँहकों के नाम होंगे. अगर आपका नाम उस लिस्ट में होगा तो आपको गैस का मुफ्त कनेंक्शन दिया जाएगा. • सबसे पहले लिस्ट में आपका नाम होना अनिवार्य है. • राशन कार्ड (APL ,BPL या PHH कोई भी चलेगा). • बैंक सेविंग खाता होना अनिवार्य है. this scheme is applicable for sadasivapeta mandal , medak dist. , telangana state of south india ?? I think this scheme will prove a changing point in bpls life. ager apl priwar ho ur garib ho to usse mil sakta h ya nahi….. This gas scheme is getting to those people who having acres of lands and income sources and high standard of living in my village and they all are above poverty line. details are as follows. Thanks to PM for introducing this scheme for the poor. But we need to authentic about the beneficiaries. Many people have TVs and live in the village. Many people having BPL cards live in well furnished house in town. Authorities concerned with identifying the true BPL will only help the scheme. If not big hands to drop in again. Sir, its good scheme should be appreciated. But since this scheme is launched there is a debate i have gone through on social media that government is not providing any remission in the money to be paid by a bpl women. Beneficiaries have to pay the remainig amount in installments. Like if at market rate a connection is of 7000 then bpl women has to pay say 1600 has to at the time pf connection and remainig amount has to pay in easy installments with intrest. Thus LPG Dealers Exploiting Poor BPL consumers People.Directly & Indirectly respective Officers supporting & collecting Hafta..
in rajsathan(banswara) also this service is applicable. after feeling the form , where i want to submit the document. Manani modi jee sahab se niwedan hai ki ye yojana bahut hi accha air aapka ucch bichar hair parantu ye yojana ke labh using ko milna chaiye Jo atti garib sreni ke ho lekin apna India me city ho ya village ,gali ho ya mohalla labh profit using ko milta hair Jo dabang ho is like modi saheb se mera request Hai please first check the original bearer of this yojana and then issue …..thanks. How can you distinguish between real B0L and APL. I wants to know that I am under Ration card. Can my family’s head take a new connection under this scheme? Please let me know how to make a connection? As per my knowledge, women are only eligible for the same. Applicants must belongs to BPL family, then she can apply. Itz not mandatory that applicants name must be in BPL list. If family head’s name enlisted in BPL list then his wife or daughter can apply for the scheme. now download ujjwala form. For supporting documents, applicant’s must submit her 1. BPL Certificate authorised by Panchayet pradhan/ Municipality Chairman, 2. BPL Ration Card, 3. one photo ID (voter/ Adhar card), 4. Bank passbook xerox,5. One copy passport photo and fillup form of Ujjwala form (2 page). Now submit all these documents to your nearest distributor. You will get a free connection, where no need to pay for 1. One New empty Cylinder, 2. One Regulator, 3. Free DGCC Book, 4. One suraksha hose, 5. Installation charge and 6. Administration charge. is it aadhar card mandatory for ujjawal scheme. Is there any android app for this scheme, How can I apply online for ujjwala yojana? Bro I’m a Panchayat employee want full Information about Yojana then what.